The Outer Banks Center for Dolphin Research, established in November 2008, is a 501 c(3) non-profit organization engaged in a long-term photo-identification study of bottlenose dolphins in the northern Outer Banks of North Carolina. Our mission is to promote the conservation of bottlenose dolphins in the northern Outer Banks through research and education. We seek to learn more about the population ecology, movement patterns, health, and behavior of coastal bottlenose dolphins and to expand public knowledge and concern for these marine mammals. Our scientists also collaborate with other marine mammal scientists along the western Atlantic coast in order to further understand their long-range movement patterns. 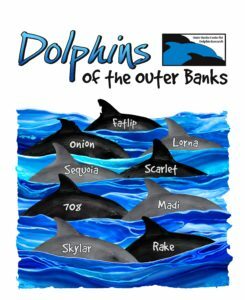 We are excited to announce that a new children’s book is now available about the life of Onion and the Outer Banks dolphins! Onion, A North Carolina dolphin follows the life of Onion in the Outer Banks. 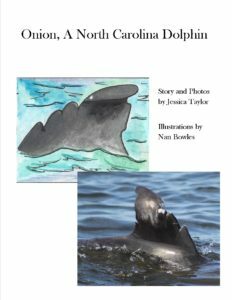 Written by Jessica Taylor of OBXCDR and illustrated by Nan Bowles of the NC Maritime Museum, this story is based upon real sightings of North Carolina dolphins! To learn more and purchase your copy online, click here! Our March newsletter is now available! Learn what the OBXCDR has been up to this spring, click here! Interested in becoming a volunteer? Attend a volunteer training this spring! Click here for training dates and more! Looking for the perfect gift for this spring? Check out our Adopt a Dolphin Program! All adoptions come with a personalized adoption certificate, dolphin fact sheet, OBXCDR t-shirt and bumper sticker, and email updates on your dolphin! Promote local dolphin conservation with your Valentine’s Day gift this year. Click here for more details! We are excited to announce a new dolphin outreach display at Jennette’s Pier! This display is a collaboration between the OBXCDR, Jennette’s Pier, North Carolina Maritime Museum, and NC Marine Mammal Stranding Response Team, and includes the rearticulated skeleton of one of our long-time known males, Moe. Funding for this display was provided by the NC Aquarium Society and the Outer Banks Community Foundation! For more details about the display, click here! Moe’s homecoming will be held on Sunday March 24th at 2:00 pm! Visit Moe on March 24 at 2 p.m. at Jennette’s Pier and learn more about local dolphin research, how the display was developed, and ways to contribute to local conservation. Presentations will be given by Keith Rittmaster, natural science curator of the North Carolina Maritime Museum, Jessica Taylor (pictured), director of the Outer Banks Center for Dolphin Research and Rachel Potts, stranding response coordinator for Jennette’s Pier. The event will also feature door prizes and refreshments. The Outer Banks Center for Dolphin Research would like to announce a new partnership opportunity with Dare Education Foundation, the North Carolina Aquarium on Roanoke Island, Jennette’s Pier, and Dare County Schools! 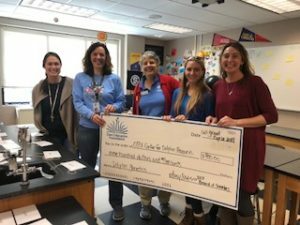 This winter, educators of the OBXCDR, NC Aquarium, and Jennette’s Pier will be leading programs for biology students at Manteo High School and Cape Hatteras Secondary School to teach about real life applications of gel electrophoresis and mapping, using sighting data collected on our local dolphins! Thank you DEF for providing the funding for these programs! The Outer Banks Center for Dolphin Research is excited to announce that we have recently received a grant from the Currituck-Dare Foundation of the North Carolina Community Foundation to fund our field research surveys for next season! Aboard our surveys, we will also conduct live streams of our dolphin sightings for local Dare County Schools students to teach students about how we study the dolphins and complement classroom activities related to dolphin biology and conservation! We are excited about this grant and opportunity to collaborate with the local schools! The 9th Annual Outer Banks Shrimp Cookoff was on Sunday November 4th, 2018 from 12-3 pm at Ocean Boulevard! Click here for details on the winners! Stay tuned for updates on the 10th Annual Outer Banks Shrimp Cookoff in 2019. Outer Banks Center for Dolphin Research t-shirts are now updated and available online! Click here to purchase! Looking for the perfect gift for birthdays, anniversaries, or another special occasion? Our Adopt a Dolphin Kits and t-shirts make great presents while supporting dolphin conservation in the Outer Banks! Click here to learn how to sponsor an Outer Banks dolphin! The OBXCDR 2018 newsletter is now available! Click here to download! Interested in volunteering with the Outer Banks Center for Dolphin Research? We are currently seeking volunteers! Click here for more information! In summer 2013, coastal bottlenose dolphins along the U.S. east coast experienced an unusual mortality event where record numbers of dolphins stranded along the beaches. The event reached the Outer Banks, NC in August 2013. For more information about these strandings, click here. The Outer Banks Marine Mammal Stranding Response Team responds to marine mammals strandings from Currituck County, NC south through Hyde County, NC. For more information on how to report a marine mammal stranding in the Outer Banks, click here. Looking to learn more about dolphins in the Outer Banks? Join us on FaceBook at Onion, A North Carolina Dolphin and Outer Banks Center for Dolphin Research as well as on Instagram at obxdolphins for updates on the Outer Banks dolphins this summer!